Once Sage Vishwamitra was perfoming a very difficult tapasya. Indra, the king of gods, was afraid that once completed, the tapasya would make Vishwamitra very powerful and he would even be able to conquer heaven. So Indra sent Menaka, a beautiful dancer of his court, to earth. Meanwhile, Vishwamitra had performed all the rituals and was engaged in meditation, which would complete his tapasya. 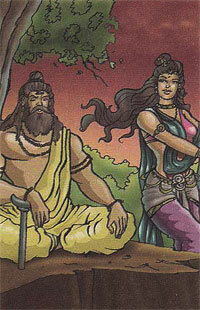 Menaka went to the forest where Viswamitra sat with his eyes closed. She sang, danced, made garlands of fragrant flowers and put them around Vishwamitra's neck to attract his attention. All this disturbed Vishwamitra and he opened his eyes. His meditation was broken. When he saw the beauty of Menaka he wished to marry her. They got married and had a daughter. Once Menaka's purpose on the earth was over, she went back to heaven, leaving behind a sad Vishwamitra.